A new attempt, the sixth of its kind, has been made to hold the first session of the Legislative chamber of the Great Khural of the Republic of Tuva. The corresponding decree was signed by Tuva's Prime-Minister Sherig-ool Oorzhak, after his consultations with President's Envoy in Siberia Anatoli Kvashnin. The previous 5 have failed due to boycott by 12 Life party deputies thus protesting against the illegal cancelling of victories of their 5 colleagues following October 8 voting. Almost 100 United Russia State Duma deputies applied to the Audit Chamber of Russia to check up on the financial activity of the Legislative Chamber of the Great Khural chamber. Governmental press-service reports numbering among those who joined in an application deputies from LDPR (Liberal Democratic Party of Russia), CPRF (Communist Party of the Russian Federation) and Rodina (Motherland). But the latter three factions press-services appeared not to be in the know of the appeal when asked by Tuva-Online correspondent. The first meeting of Tuva's Great Hural parliamentary organizing session was broken down for the fifth time. This time in difference to the previous ones, when sessions were appointed by Sherig-ool Oorzhak's Decree, it was scheduled by Presidential Envoy in Siberian Federal District Anatoly Kvashnin when he was in Tuva meeting Tuvan deputies. Kvashnin was trying to solve a parliamentary crisis offering a new date but it was again boycotted by twelve deputies from Russian Party of Life who protested against canceling the election of their five colleagues in favour of United Russia party, as they believe. Legislative Chamber of Great Khural has failed to hold its first organising session. 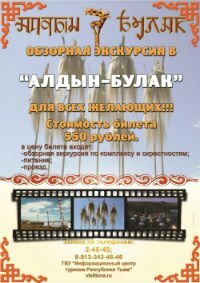 Today out of 27 elected deputies only 15 representing United Russia have come to the concert-hall of the Folk Arts House appointed as a place of gathering by the Tuvan Prime-Minister's Decree. The rest 12 from the Life party have ignored the session. It is a third attempt to make all elected into the lower chamber deputies meet. The first two were undertaken on October 30 and November 1. Two parties - United Russia (15 deputies) and Life party (12 deputies) - have to negotiate their strategies in the Legislative Chamber of Great Khural where none of them has an overwelhlming majority. In order to make a decision one has to have at least 17 votes pro (half of the established number of deputies plus one vote). Kyzyl Election Comission decided to recalculate votes in spite of the fact that the three day term to announce official election results in the capital has been already bypassed. Life Party leaders are sure that this decision is made in favour of United Russia which has lost in five out of six one-seat Legislative Chamber constituencies to the Life party candidates. Tuva has not yet announced the official results of Sunday voting in contrast to the other eight regions of Russia in which parliamentary election took place, and in which the election results were made public on the next day after voting. This situation was severely criticized by Alexandr Veshnykov, head of the Central Election Commission of Russia at the press-conference following the Sunday elections. Alexandr Veshnyakov, Central Election Commission head, made a tentative review of the results of the voting that took place on Sunday, October 8: "As you all remember, about 14 million voters were eligible to vote in elections of different levels. On average, the turnout in elections to the legislative assemblies in the regions of the Russian Federation was 35.6 percent. The smallest turnout was in the Sverdlovsk Oblast (about 27.9 percent) and the highest turnout was in the Republic of Tyva (52.2 percent)." The voting to elect deputies to the bicameral parliament started in Tuva at 8 a.m. local time (4 a.m. Moscow). Over 150,000 voters are expected to turn up at election polls. Parliamentary elections in Tuva are accompanied by scandal. Yesterday 90 observers from the Moscow Life party came to Abakan by air as the Tuvan airport services refused to receive the plane. With a week left before the election date, October 8, black PR methods are more actively engaged to make people vote for the needed candidates. 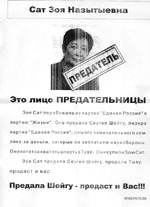 Life party candidates, main United Russia rivals, have been named 'Shoigu's traitors' in leaflets glued onto all the public places in Kyzyl. Shoigu's name esteemed in every house in Kyzyl has been actively engaged in United Russia propaganda campaign but none has expected that it can boil to black PR as well. The leaflets are accompanied with poison-pen texts saying who is your enemy and who is your friend.